This evenings event was held at the funky offices of Unruly and covered the subject of UX challenges. Although many people think UX is easy, we are all aware that it is not as easy as it should be, and tonight's talks showed us how much more challenging it can be. We started with Rosie FitzGerald who works for the BBC, on CBBC and CBeebies. While I think of these as mainly being TV channels they also cover apps, games, websites and content on the iPlayer. Rosie talked about doing user testing with children and the challenges this creates. The first thing she told us was that we often fear children, or at least their reactions to what we ask them to do, and it seems that they can sense it. She then offered us some tips on getting the best out of them. For starters time of day and the length of the session are key. Rosie runs most of her sessions between 3pm and 5pm with a session a maximum of 20 minutes. She then talked about ways to make children comfortable and how to get the best out of them, for instance testing with siblings or friends. She also talked about how you can use parents to help you, using them as a translator. Next we heard from Steph Wilson and Jane Marshall from City University, who have been working on a project called Eva Park which helps people suffering from aphasia practice speaking. There are about 11.6 million people in the uk with disabilities, with about 2.2 million suffering from communication difficulties. Aphasia is caused by brain injury, often the result of strokes, and can have varied affects on people from loss of speech, reading, writing and comprehension to cognitive difficulties. This means there is a high level of digital exclusion. The Eva Park project team wanted to look at how to include people with aphasia in the design process and then design something for them. They found the most important thing was having tangible things that their users could actually see and touch, for instance photos that the user could move around. The end result was a virtual world which really helped their users practice speaking and the start of guidelines for others to work with. 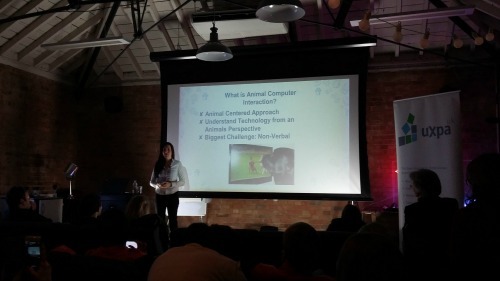 Lastly we heard from Ilyena Hirskyj-Douglas who is working on Dog Computer Interaction (DCI). This all started when she noticed her dog watched TV, but not just any TV. TV with animals and particularly dogs on it, so she started to film him. Ilyena, and I expect most other dog owners, firmly believe that dogs communicate with us even if they can not speak to us. Their body language tells us so much, as does their behaviour. Ilyena has created a framework called the doggy ladder of participation around which she bases her work. It is very important to her that the dogs she works with are not being trained to do something but interact on their own accord. From this she can see their natural responses to her work. It was a fascinating evening which gave us all a lot to think about. 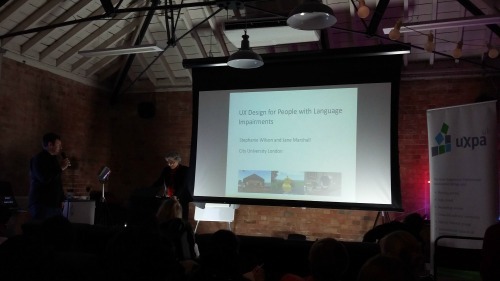 My key take away from all three talks is that it is a good idea to alter your testing methods for your users, whether that be children, people with language impairments or dogs.